CALLING ALL ADULTS WHO WISH TO LEARN THE BASICS OF MUSIC...OR THOSE WHO SIMPLY WISH TO BRUSH UP! Got music but ain’t got no rhythm? Ever wonder what all those dots and lines mean? Want to write down that tune you’ve been whistling? If you answered YES to any of these questions, then attend the STAMP Workshop! The ABCs (and DEF&Gs) of Music provides a foundation upon which to build your knowledge of music. By the end of the workshop, you will know the basic elements of music, so you can begin to read—and even play—music! COST: $10 at the door. Cash, check (made payable to St. Aidans-STAMP), or debit/credit card accepted. 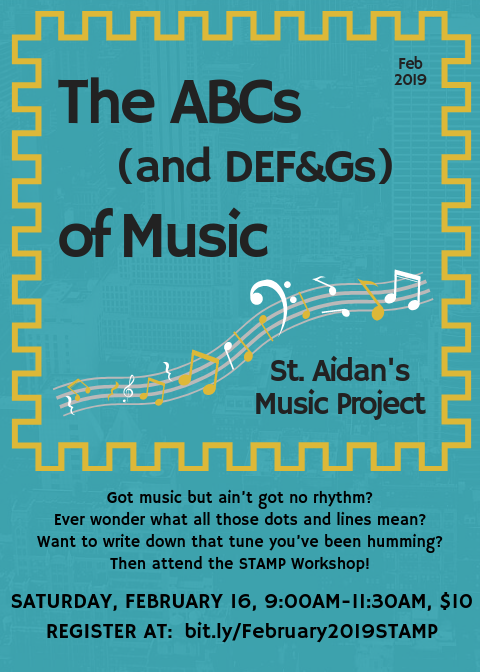 QUESTIONS: Please contact Elizabeth Alvarez, STAMP Director, at stamp@staidans.org.